The 1920s was a bad time to start clinging on to post-romanticism; Joseph Marx, 22 years Hugo Wolf's junior, and so obviously a natural successor, just got swallowed up by his period. While Berg, Schönberg, and Webern were gradually defining the future of composition, Marx, already a major figure in Vienna, became more and more obsolete. What I didn't know before acquiring this disc was that he was hired by Atatürk in 1932 to promote Western-style music-teaching methods in Turkey, before the more avant-garde Paul Hindemith took over a year later. Clearly a baton had been passed. What could he have imagined the musical world would turn into by the time he died in 1964? With one of the last respected carriers of the tonal torch, Poulenc, having died the previous year, Marx was a forgotten relic in the court of Boulez, Henze, and Stockhausen. Reappraisal of him has been sporadic but passionate, with some enterprising discs of his orchestral work appearing, and a smattering of his Lieder still being called standard repertoire, popular with singers like Renée Fleming, Irmgard Seefried, and even Leontyne Price, eager to sing something other than Wolf or Strauss, but an entire disc of his songs is still rare. CPO has done well in attracting a star like Angelika Kirchschlager to this broad selection of 24 songs, and her light but creamy mezzo is ideal for these unashamedly romantic pieces that also require a more nimble touch. The densely written accompaniment (like Strauss, Marx writes very orchestrally for the piano) is beautifully handled by Anthony Spiri, giving these readings a lively, less self-regarding air than many Marx interpretations, such as Fleming's rather grand account of Selige Nacht on Decca, which comes in a minute longer than Kirchschlager's. Wisely picking texts from the Italienishes Liederbuch that were not set by Wolf, Marx wrote 17 settings, 11 of which are given here. They are remarkable not just for conveying the text's quicksilver changes of mood and tone but also for their corresponding musical styles. There is a definite chanson feel to Am Fenster , as befits the languid love poem, and there is something very Slavic about Es zühnt das Meer' s stormy, heated passion. It is hardly surprising that most of these were written in eight days, such is the profusion of melodic ideas and tonal changes. These are works of untamed brilliance. Next is Marx's Verklärtes Jahr , a 1932 cycle of five poems, including Auf der Campagna, written by Marx himself. 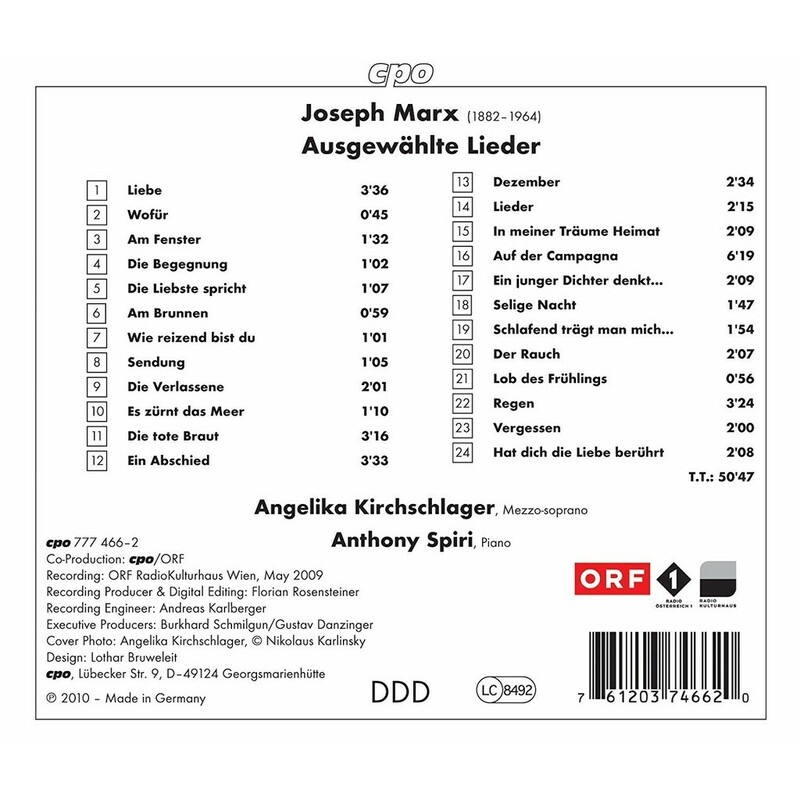 The overriding themes of exile and death (the song Dezember is dedicated to Marx's parents) are vividly caught here in this mature work. A similar sense of Heimat is apparent in the remaining eight songs, like Der Rauch . Paradoxically there is nothing French in style about Marx's setting of Verlaine's Rainfall ( Regen ), a dark, shadowy piece though it is. Hat dich die Liebe berührt , a love song with the same autumnal poise as Strauss's Morgen , provides a soulful conclusion to a slightly random but convincing overview of Marx's Lieder output. It is not always helpful constantly comparing Marx to Wolf, but for those who still find the elder composer's style too elusive, Marx can be the way in, as the more immediate melodist and the one less reluctant to wear his heart on his sleeve. This is just the disc to start one's journey of Marxism with; beautiful in their way, the diva approaches from Price and Fleming tend to smother these delicate works. Although some of Kirchschlager's chocolate color to her mezzo is beginning to fade, it is scarcely noticeable and more than compensated for by her love of text; she is a modern singer who revels in word-painting and expression, increasingly rare nowadays, but absolutely essential to get these little 20th-century gems to shine. Sound is bright and clear, although Kirchschlager is a little too closely miked. Also, at 50 minutes, it is a short CD; surely there was room for the rest of the Italienisches Liederbuch settings, not to mention the other 120 songs to pick from. I do hope this is an ongoing series from cpo, as the presentation is up to its usual standard with superb essays and translations. This one's a keeper. The music of Austrian composer Joseph Marx (1882-1964) largely fell out of public favor very early in his career, after the First World War, but he continued to compose in the same lushly late-Romantic idiom throughout his long life. A significant part of his work consists of songs and because of that and because of their shared interest in some of the same poets, he is sometimes compared with Hugo Wolf, over 20 years his senior, but his music is closer to the harmonic conservatism of his friend Erich Wolfgang Korngold, whose European career also went into eclipse in the wake of the war. The songs recorded here, written between 1907 and 1932, show little stylistic development, and all have the characteristics of typical fin de siècle lieder: ingratiatingly warm harmonies, generously lyrical vocal writing, and sensitive text setting. Marx's Germanic Romanticism is flavored with impressionism and some of the harmonic freedom of Scriabin, but his voice is not particularly distinctive. Fans of late-Romantic and post-Romantic lieder are likely to find them immensely appealing, though. The songs are varied in mood and tone, his accompaniments are inventive and evocative, and his shapely vocal lines give singers plenty of opportunity to shine. Mezzo-soprano Angelika Kirchschlager's voice is beautifully suited to this repertoire. She has an almost soprano-like brightness, she can soar gracefully through the songs, and she brings a broad expressive range to the music. The warmth and clarity of her voice are especially evident in songs like Am Fenster, Sendung, Selige Nacht, and Schlafend trägt man mich in mein Heimatland, a little jewel of a song. Anthony Spiri provides a flexible and beautifully shaded accompaniment, making the most of Marx's idiomatic piano writing. CPO's sound is clean and nicely balanced. Joseph Marx was a master of lyrical atmospheric music. He has often been compared to Hugo Wolf, who was twenty years his senior, because song was the foundation on which their respective creative oeuvres rested. While Wolf was a bold, stormy innovator, Marx was a Dionysian who both expanded and maintained and precisely in his song oeuvre turned more to the blending of contemporary trends with the past in splendid new attire than to an imponderable future. 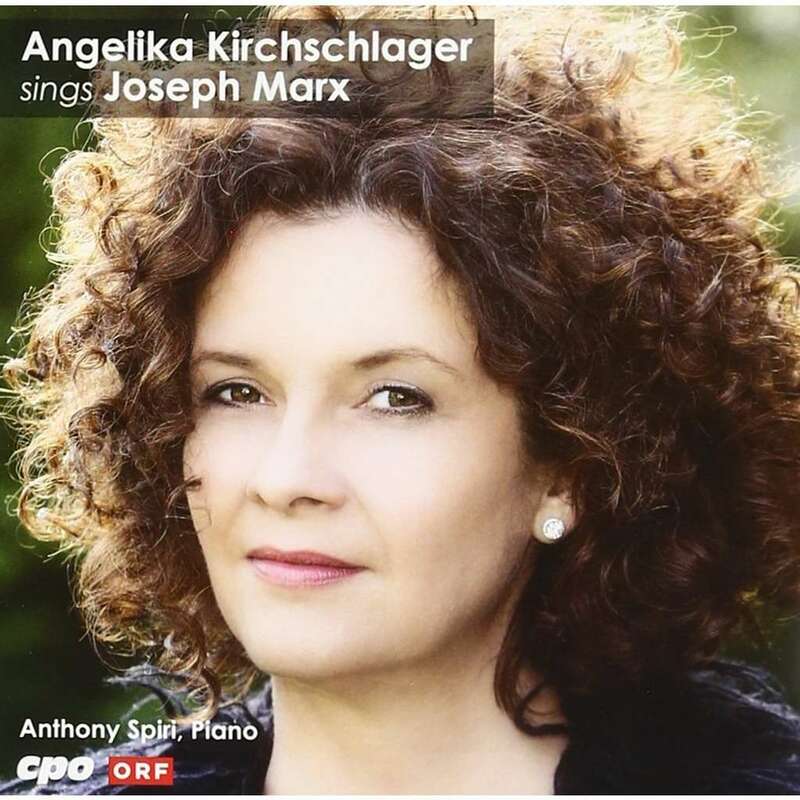 Angelika Kirchschlager, one of today's most renowned lied singers, is absolutely captivated by the lyrical charm and the incredibly multifaceted expressive power of Marx's songs, selected a representative sampling together with her piano partner Anthony Spiri, and produced an exemplary recording for cpo. The songs from the Italienisches Liederbuch of 1912, for example, display all sorts of different moods (dramatic, delightful, gloomy, humorous), and one quickly understands why Marx's compositions were so popular during his lifetime: for every atmosphere or mood he perfected and uniquely shaped a musical whole. Joseph Marx war ein Meister der lyrischen Stimmungsklanglichkeit. Man hat ihn oft mit dem 20 Jahre älteren Hugo Wolf verglichen, denn bei beiden war das Lied der Grundpfeiler ihres Schaffens. Aber wo Wolf ein kühner, stürmischer Neuerer war, war Marx ein dionysisch erweiternder Bewahrer, gerade im Liedschaffen mehr einer in prachtvoll neuem Kleid auftretenden Verschmelzung von gegenwärtigen Strömungen mit der Vergangenheit zugewandt als einer unwägbaren Zukunft. Angelika Kirchschlager, eine der profiliertesten Liedsängerinnen unserer Zeit, ist dem lyrischen Charme und der unglaublich vielseitigen Ausdruckskraft der Marxschen Lieder erlegen und hat mit ihrem Klavierpartner Anthony Spiri eine repräsentative Auswahl getroffen und mustergültig für cpo eingespielt. So zeigen z. B. die Lieder des 1912 entstandenen Italienischen Liederbuchs ein Wechselbad unterschiedlichster Stimmungen, dramatisch, lieblich, düster, humoristisch, und man versteht schnell die zeitgenössische Popularität der Marxschen Kompositionen, weil er in jeder Stimmungslage zu vollendeter, eigentümlicher Formung des Ganzen fand.